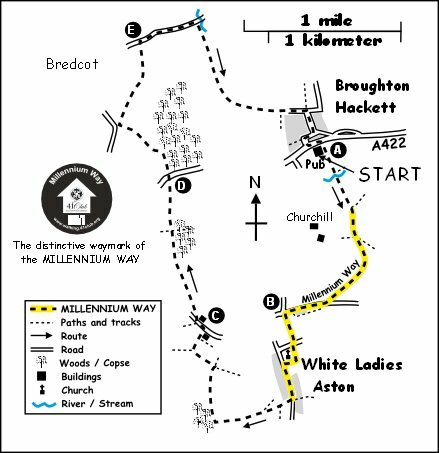 A pleasant 5½ mile circular walk from Broughton Hackett with the opportunity to enjoy the delights of the Worcestershire countryside. The MILLENNIUM WAY section is clearly waymarked with the green and white circular waymarkers. Find out more about the walk by clicking on the information icon. 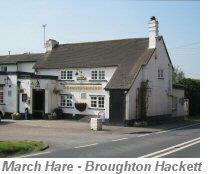 We start our walk from The March Hare in Broughton Hackett. 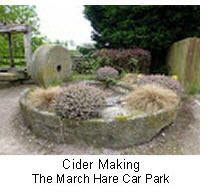 ( NB: if you do not intend to use the March Hare for refreshment or food please do not use the pub car park. Parking is available in the lay-by just up the road towards, or coming from, Upton Snodsbury). Emerging from the car park turn right onto main road, then almost immediately right down the surfaced lane passing the leisure centre. Cross over cattle grid to go gently uphill across field ahead. Pass under power lines and take the large metal gate ahead continuing with fence and hedge right to pass a waymark post in the wire fence R to reach large metal gate in corner of field. Here you have joined The Millennium Way and will see the distinctive green Millennium Way waymarker. Go through gate and after a few paces take the next large gate left into field. Follow around edge of field with hedge right to find far right corner metal gate. Take gate then go over bridge and ahead to take gated hedge gap then 1/4 left to find metal gate into copse. Ahead through copse to find track (which can often be quite muddy). Go right on track which becomes a road passing houses left to arrive at a junction of roads. At the junction, take gap immediately left by power pole, and go with hedge left to take hedge gap leading to road. Cross road to take footpath through the churchyard. (You may wish to make a short visit to the church.) Exit the churchyard by wide gravel path and take gate to road. Go left along road, pass wall right and round right hand bend in road. After about 50 paces, at end of red bricked barn, take finger post R to go up track with wall and hedge R. Leave path when it swings L, and continue ahead with hedge R to find and cross broken corner stile / bridge to field. Go left 40 paces to field corner and go R with hedge L. Here we leave The Millennium Way. Continue along with hedge left. Continue ahead into next field keeping hedge left walking towards narrow copse. On reaching copse turn right ( do not enter copse ) and go up field with hedge and copse left. Pass under power lines and take gap ahead into next field. After a few paces take waymarked path left through hedge gap into next field continuing with hedge left. At the next gap enter field left and go ahead keeping hedge right. After 100m take the waymarked gap right over wooden footbridge and through kissing gate into field and continue up field with hedge right to take the stile ahead. Follow waymarker right around edge of next field to reach road. 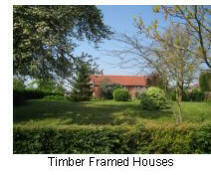 Go left on road and immediately past Spring Cottage take footpath right through wooden gate. Then please keep close to the right boundary, and follow around the boundary of this grassy area to take corner fence stile into next field and then go ahead with hedge right. Stay on same heading through field corner gap ahead and continue along edge of four fields with hedge and wooded area right, to reach the main road. Cross over main road (A422) taking great care as this is a very busy road. Follow footpath opposite keeping Churchill Wood on your right. 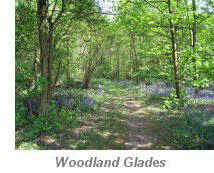 (The route does not enter the wood but you may find a shady nook to take a break and some refreshment.) Take the gap ahead into next field immediately going left along edge of field with hedge left. At the way post follow direction of waymarker to go diagonally R across field. ( If the footpath has not been reinstated across the diagonal, you may have to walk around edge of field . ) Soon another way post comes into view, take gap then over stile and go downhill. Just before reaching road take footpath right through large metal gate and go ahead keeping ditch left. 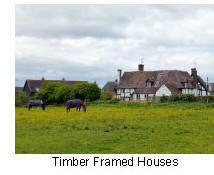 Take the gated corner field footbridge, cross over farm track and take gate into field. Go half right across field under power lines to take stile / bridge some 10 paces in from field corner. Go up field keeping hedge left and over stile to reach road. Turn right on road for 500m and just before the bridge turn right through gate and continue along edge of field with stream left. Take gate into next field then through gap ahead over stream. After a few paces take waymarked gate left then go right up field keeping hedge right. Go gently uphill, under power lines to take stile at corner. Go ahead 30 paces to take next stile right then continue along next field with hedge left. Go through large metal gate and continue ahead towards the hamlet of Broughton Hackett directly ahead. Take stile or adjacent metal gate and pass houses to arrive at T-junction, then turn right past the attractive church of St. Leonards. At the next T-junction turn right and follow lane around to left to reach the main road. Turn left and you are now back to The March Hare. The small 14thC church of Churchill to the west is that of St Michael of Oswaldslow and is now in the care of the Churches Preservation Trust having been closed in 1999. 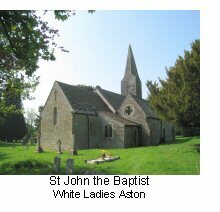 In its early days the parish was known as Aston Episcopi The name White Ladies Aston derives from an order of Cistercian Nuns from Whitstones, north of Wocester who were granted land in the parishin the mid 13th C. The church of St. John Baptist was enlarged with the aisle and vestry in 1861 but it stands largely unaltered since the 12th C. Windows have been inserted in the 14th century and another in the 15th. The round-headed south doorway is 12th C . The font, probably of the 13th century, is of a dark red sandstone with a twelve-sided bowl. There are three bells: the first dated 1707; the second 1636; the third inscribed 'Sancte Jacobpe, ora pro nobis,' with a crowned female head and a cross. 'The Puritan commander, noticing a pretty Miss Good, became very rude in his attentions, and to save herself from outrage she fled into a neighbouring wood, where she climbed into a tree and shrouded herself among the thick foliage and thus escaped further notice'. On the 28th August 1651 Cromwell stayed a night at a house in White Ladies Aston before the battle of Worcester. 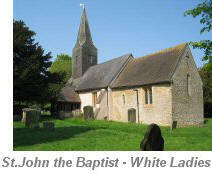 Bredicot to the west has a church dedicated to St James the Less not a lot to be said.